Whether you’re trying to lure deer to your trail cam or live in a state where you can use bait for hunting, using the best deer bait is key to success. To help you find the right one for you, we researched different varieties and some best-selling products to put together these deer bait reviews. Before we get to our top ten list, let’s take a look at some of the features you should know about before you shop. Formula: There are a few different forms of deer bait, including granular, liquid, spray, and even wafers. They each function a little differently but are all effective in the right conditions. Choose the one that works best for you. Scent/Flavor: These are flavored or scented with a few different things. 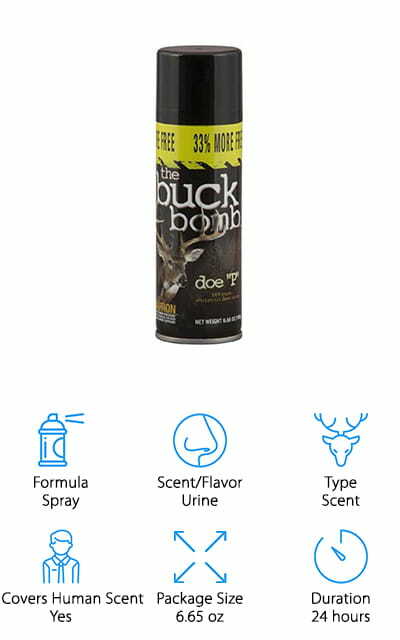 Doe urine is a popular scent when it comes to liquids and sprays, especially during rutting season. Acorn is a favorite for granular formulas or blocks. Type: We reviewed 3 different types of bait: food, scent, and licks. They all work in different ways but, just like the formulas, you’ll find one that will work best in your situation. It’s all about preference when it comes to type. Covers Human Scent: If you’re looking for hunting bait, it’s important to find one that covers human scent. If the deer smell something good but can still smell you, they may stay away no matter how tempting the bait it. Package Size: This really depends on the type of bait you’re using. Granules come in packages by the pound while liquid baits are available in bottles as small as 1.6 ounces. Consider the concentration of the bait, too. Duration: This is a tough thing to nail down, really. Sprays usually last a day or so while blocks can last up to a whole year. With food, it all depends on how fast the deer eat it up. Now that we’ve taken a closer look at some of the key features, let’s move into our reviews. If you’re in a hurry, the best place to start is right at the beginning. Our top and budget picks are the first 2 products on the list and will give you a good idea of the range available. All of these products are unique, though, so keep reading if you can! So, what is the best bait for deer? Let’s find out. 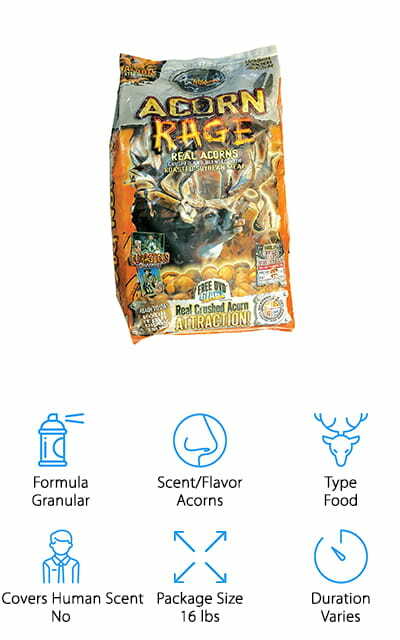 Our top pick is the best deer bait for sale, Wildgame Innovations Acorn Rage. One of the great things about it is you can mix it with other feeds, like corn, but it works fabulously on its own. 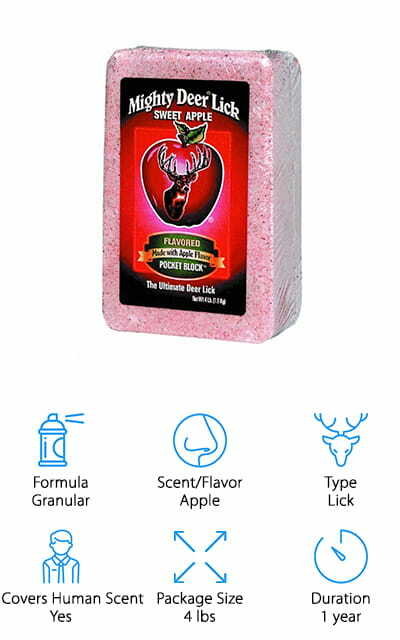 This is a great choice because it’s beneficial to the deer as well as being an attractant. The recipe was developed to improve their overall health as well as support strong antler growth. There isn’t anything artificial about this product and it’s not an odor or an extract. It’s real acorns that deer are naturally drawn to. It’s perfect for a feeder or you can just spread it on the ground and wait for the deer to arrive. This is a big bag that will last a long time, depending on how frequently you use it. If you’re looking for the best cheap deer bait, you can’t do much better than Tink’s Buck Lore. This one is designed to work with the natural breeding cycle of the deer and is perfect for early in the season. That’s when pre-rut and rut falls. What exactly does that mean? That’s the time when bucks are too busy looking for a mate to worry about much else. So, they’re out in the open more and not really paying attention to other things. Like you. Tink’s Buck Lure is 100% natural and uses doe urine that was collected at the optimal time in their cycle to attract a buck. It comes in a bottle with an easy-to-use squirt top and is meant to be used in scent bombs or drag rags. 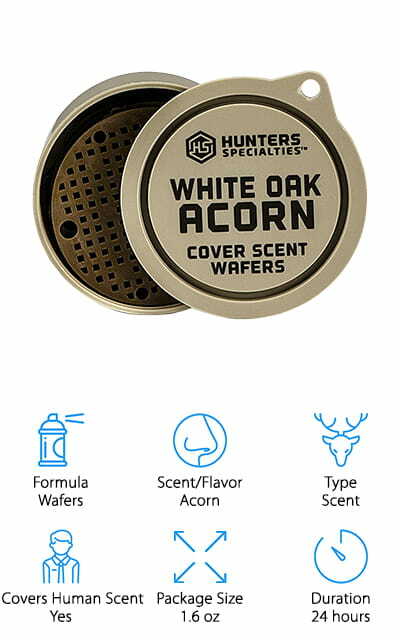 The best bait for deer hunting if you’re planning to set up camp is Hunter’s Specialties Cover Scent. This formula was designed to cover up human scent and can help you and all your stuff remain a little inconspicuous. They smell like the forest, a mix of acorns and dirt. So, it draws the deer to you while with the acorns but hides your smell so they don’t know you’re waiting for them. You can either hang them around your camp or pin them right to your clothing. And here’s the kicker: they regenerate their own smell. All you have to put them back into the container and the smell gets stronger again. That’s because the wafer itself is actually giving off the scent. There’s nothing added and nothing to run out. Another good deer bait that’s super effective is this Buck Bomb. The Doe “P” scent is particularly effective. This is a simple spray that’s really easy to use. The bottle itself lasts a really long time. Why? Get this: the atomizer sprays out a single drop of urine into 3000 particles. They’re so small that they waft easily through the air so it’s more likely that a buck will take notice. It also provides a pretty good cover. The particles easily cover everything from trees to grass and it lasts about a day once atomized into the air. You can easily establish a trail to lure a buck who’s looking for a mate. This is a great option for any time during deer season. You can even use it to cover up your own scent. Some of the best bait for whitetail deer is this Mighty Deer Lick Block. One of the best things about it is how long it lasts. It’s hard and durable and it can last for up to 1 year depending on how quickly the deer get to it. Another great thing is that it was specially developed by scientists to help the deer survive harsh winter months. It helps them retain the water and fat they need to get through the long, cold months when food is scarce. The best use for this deer bait is to keep them away from places where they’re not welcome. If the local deer are eating your garden or keep running across a local roadway, placing this block nearby will give them a reason to steer clear. The best mule deer bait is the Nationwide Scents Deer Lure. It’s made of 100% deer urine that was collected fresh and is as pure as it can be. They don’t add any kind of preservative which keeps the scent as natural as can be. One thing that’s different about this one is that it uses buck urine whereas other brands typically use doe urine. The theory behind it is that a buck in the area will smell the urine and assume that another buck is close by and in hot pursuit of a rutting doe. It brings out the competitive spirit of the buck and can lure bigger bucks much faster. It covers up human scent, too, so that they stay focused on finding a mate. This is a great, inexpensive bait that’s super effective. 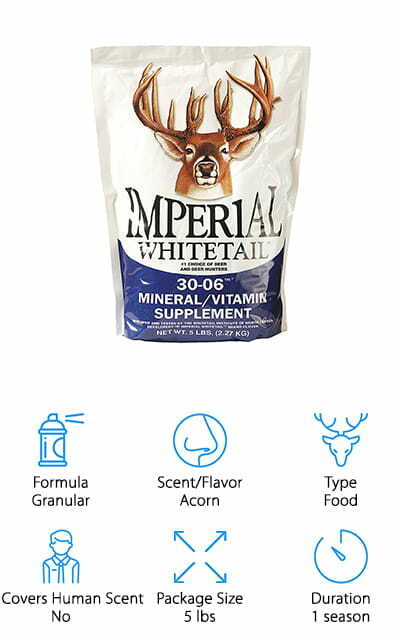 Whitetail Institute’s Mineral Supplement is a great choice for a trail cam or if you just like to look at the wildlife that lives close by. This recipe provides the herd with the nutrition they need for the spring and summer. This helps them prepare for pregnancy and lactation months before rutting season so they have happy, healthy fawn. Deer love it because it tastes good and it was designed especially for them. They’re drawn to both the scent and flavor and helps them get all the vitamins and minerals they need for later in the year. This is much more than a simple food bait, it actually really helps the local herd. All you have to do is spread it around in front of your trail cam or put it in a feeder. C’mere Deer 3 Day Harvest is the best deer bait for late in the season. Why? Because that’s when natural food supplies are running low and it starts getting colder outside. The deer’s sense of smell will lead them right to this bait. They love the taste and will keep coming back for more. It gets its name because it really is a 3-day system because it’s not made to use all at once. You’re actually meant to spread some and wait for the deer to come. Then, spread more the next day and the next and you should see the deer returning and maybe even bringing the rest of the herd. If you scatter it into a large area in front of a trail cam, you should be able to see a lot of deer. This bait is unique in that it’s actually a powder that’s been fortified with essential vitamins and minerals. All you have to do is spread it around in a wide area. You don’t want the deer to cluster in one area so the wider your scatter the powder, the more deer you can attract. There’s no prep or mixing required either so this bait is really easy to use right out of the bag. 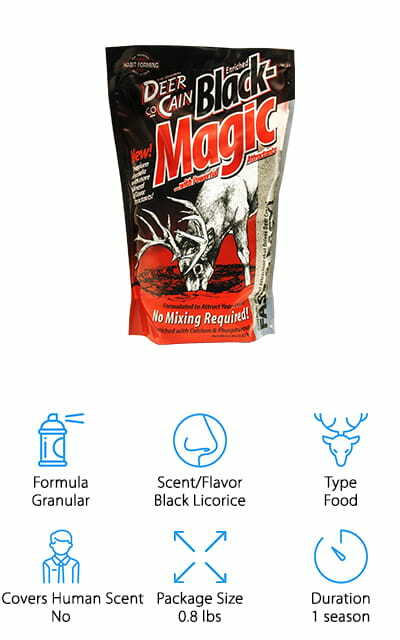 Evolved Habitat Black Magic smells like black licorice and attracts deer because it just tastes really good. 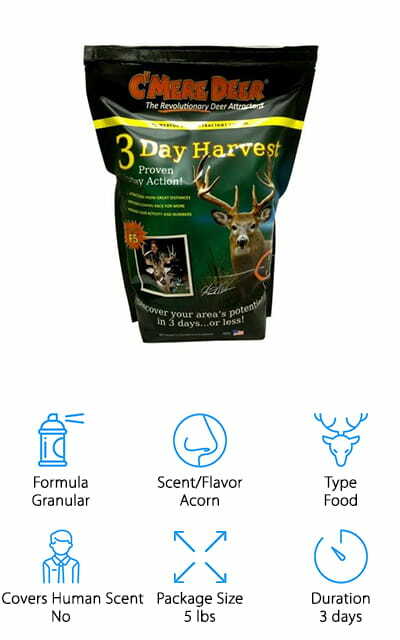 This special blend has been formulated to keep the deer population healthy by making sure they get the vitamins and minerals they need. To make sure you get great views on your trail cam, this is an effective, easy to use choice. Last up in our deer bait buying guide is Hunters Specialties 200004 Depth. One of the best things about this bait is that it’s so easy to use. All you have to do it hang it and you’re ready to go. This block bait is really hard and can last weeks depending on how many deer get to it. 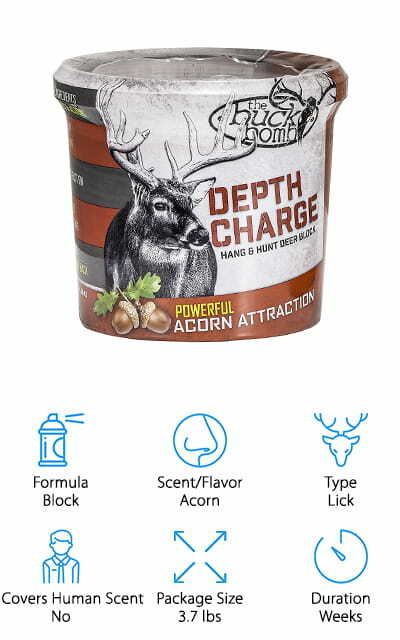 It’s made of all natural ingredients and has an acorn smell and taste that deer love. Here’s how it works: when air hits the block, it starts to break down. This breakdown is actually what you want, it releases the sweet smell that’s going to lure in the deer. The block is designed so that the deer can only lick small amounts at a time. That keeps the deer coming back for more.